After night long talks with bailout negotiators at a central Athens hotel, the new multibillion-euro bailout deal has been closed. GREECE HAS REACHED a deal with its creditors, according to a government source. After night long talks with bailout negotiators at a central Athens hotel, the new multibillion-euro bailout deal was closed. It’s hoped this will keep the country in the eurozone and avoid bankruptcy. Earlier this morning, the Greek Finance Minister Euclid Tsakalotos said there were a few minor details were left pending. This are now believed to have been resolved after the 18 hour marathon talks with the European Union, the European Central Bank and the International Monetary Fund. At a crunch July 12-13 summit, eurozone leaders offered Greece up to €86 billion over three years to allow Athens time to get its struggling economy back on track and stabilise public finances overwhelmed by a debt mountain of around €320 billion. In return, Athens were told it must accept more austerity measures — painful tax hikes plus spending cuts coupled with reforms to modernise the economy. Going into the talks the Greek government hoped to push the new €85 billion three-year agreement through parliament this week. However, many in the ruling left-wing Syriza party voiced their opposition to the deal, which would see the imposition of further spending cuts among a series of austerity measures. Two previous rescue packages in 2010 and 2012 cost a combined €240 billion, plus more than €100 billion in an unprecedented private-sector writedown. The creditors — the European Union, the European Central Bank and the International Monetary Fund — say a third package is needed to keep Greece afloat after successive governments failed to live up to their commitments. Greece says it has done its best but with an economy in deep recession for six years, the austerity measures only made matters worse. Why not cut the debt? Greece’s debt equals about 170 percent of annual economic output and many, including the IMF, believe the country can never hope to return to growth unless it is reduced significantly. Germany however strongly opposes that option and insists debt relief can only be considered after Greece has met all its latest reform commitments. What do the creditors want? Creditors want concrete reforms and an unequivocal Greek government commitment to implement them as rescue funds are handed over. Greece will have to cut the costs of its pension system, followed by far-reaching reforms to open up the economy and increase competition. Athens will also have to ease labour market regulation to make it easier for companies to hire and fire. The aim is to cut spending and increase revenue so that the government generates a surplus — before interest payments — so as to help pay down the debt. Greece last year did run what is known as a primary surplus — a state’s budget surplus prior to debt financing — but with the economy going sharply into reverse since Tsipras came to power, its finances are once again deeply in the red. The next step would be for the Greek parliament to approve the reforms package, likely on Thursday. The eurozone’s 19 finance ministers, headed by Jeroen Dijsselbloem of the Netherlands, would then review the accord, possibly on Friday. It must then be approved by the parliament of several member states, including the most crucial one, Germany. That scenario would provide plenty of time before Greece must repay some €3.4 billion euros to the ECB on August 20. If there is no agreement, Brussels is expected to organise another bridging loan similar to that arranged for July 20 when Greece had to repay debt to the IMF. 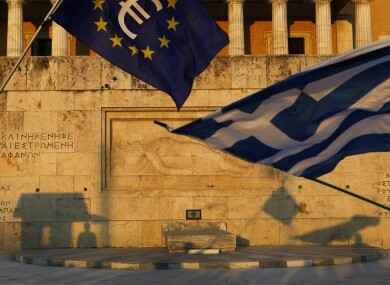 Figures next week are set to confirm that Greece’s recession deepened in the second quarter as concerns over the country’s euro future dented confidence. Read: Why have we not heard anything about Greece for a while? Email “Greece has reached a deal with its lenders. Here's what it means”. Feedback on “Greece has reached a deal with its lenders. Here's what it means”.